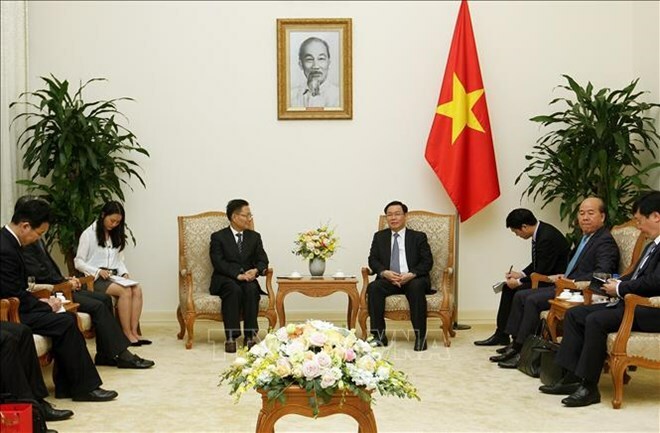 Hanoi (VNA) – Deputy Prime Minister Vuong Dinh Hue stressed the importance of Yunnan in Vietnam-China relations while receiving Standing Deputy Governor of the Chinese province of Zong Guoying in Hanoi on April 1. The host congratulated Yunnan on its major development achievements, including an economic growth rate of 8.9 percent – the third fastest in China – and the gross domestic product of over 266 billion USD in 2018. He noted that trade between Vietnam and Yunnan increased by 13 percent last year from 2017 to reach 4.15 billion USD. Coordination in border management has been maintained, helping to enhance the two countries’ comprehensive strategic cooperative partnership. As a province sharing a border and traditional friendship with many Vietnamese localities, Yunnan is very important to Vietnam-China ties, Deputy PM Hue said, asking the two sides to strengthen diplomatic, trade, and investment links. They should also increase experience sharing in urban and rural management and economic development at both central and local levels. Yunnan and Vietnam’s ministries, sectors, and localities should also boost the implementation of cooperation mechanisms and programmes like the joint working group of the Vietnamese provinces of Ha Giang, Lao Cai, Lai Chau, and Dien Bien alongside Yunnan province. They need to promote the economic corridor running through the Chinese province and Vietnam’s Quang Ninh province, Hai Phong city, capital city of Hanoi, and Lao Cai province, he noted, calling for more exchanges between residents in border areas. At the meeting, the Deputy PM also asked Yunnan to facilitate bilateral trade by importing more high-quality agricultural products from Vietnam and supporting investment from Vietnamese firms in the province. For his part, Deputy Governor Zong congratulated Vietnam on its recent socio-economic attainments, stressing that Yunnan supports the common perceptions reached by the two countries’ leaders on developing the comprehensive strategic cooperative partnership. He said his province is calling on Vietnamese and Chinese businesses to partner with each other. The official also proposed some solutions for the Vietnamese Government towards reinforce bilateral relations, including renovating the transit rail route from Lao Cai province to Hai Phong city to help facilitate trade between Yunnan and China’s southwestern region with Vietnamese localities, bringing Yunnan’s goods to more international markets.